favorite pastimes — criticizing the Federal Reserve. Paul returned to Capitol Hill on Wednesday to question Fed Chairman Ben Bernanke, who was appearing before the House Financial Services Committee to deliver his semiannual testimony. The longtime central bank critic and author of End the Fed opened with a lengthy critique of the central banking system, which he maintained is a wrongheaded experiment that has fueled bubbles and bursts in the financial system. "Nobody's smart enough to have central economic planning," he said. "Our time has come for serious discussion on monetary reform." 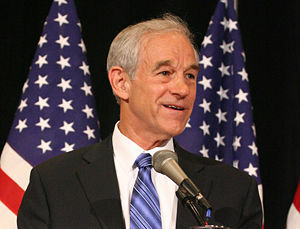 "The Fed's going to self-destruct eventually anyways," Paul added later.